We are inhaling and literally eating plastic. A lot of plastic wastage is dividing into smaller particles and are mixing in air and in land. And hence we are inhaling the plastic particles and eating the plants that absorbed plastic from land. Usage of plastic products in increased multifold, and hence the production of plastic is rapidly increased. There are no cheap alternatives to plastic bags and other plastic products. Plastic is very inexpensive, and hence is being used by almost everyone. There is no proper awareness among public about the ill-effects of plastic usage. Though there are bans on plastic bags, the alternatives are not encouraged enough. There is no responsibility assigned to manufacturers of plastic products and hence the production of plastic is still high. Many things such as food items, cosmetic products are all wrapped in plastic because once the products are sold, there is no responsibility of the plastic wastage on manufacturers. Only 21% of the plastic is recycled (till 2017) and all the remaining plastic garbage is polluting air, land and oceans. Recyclable plastic items are also thrown into garbage and are not being recycled. Single use plastic items constitute half of the plastic pollution. Plastic garbage is causing land, air and water pollution. Discarded plastic items are dividing into small particles and we are inhaling those particles. When the plastic is burned along with other garbage, it release poisonous chemicals into air which causes severe health problems. Most of the plastic waste is mixing in oceans, posing severe problems for marine life. A lot of ocean animals are dying by eating plastic waste. Fishes are eating polystyrene (small plastic particles). When we eat these ocean fishes, we are indirectly eating plastic. Plastic waste is polluting land and ground water as well. Plants are absorbing small plastic particles. Plastic waste is preventing rain water from seeping into the ground. These products clog drains as well. Bangladesh witnessed worse floods due to plastic waste and hence imposed ban on plastic. Many animals are dying by eating plastic covers. These days everything including food is wrapped in plastic. When these products are exposed to heat, it releases dangerous chemicals such as BPA (bisphenol-a) into food. The same goes with plastic bottles as well. This causes severe health problems when consumed. Poly vinyl chloride & poly carbonates that are present in plastic waste causes skin diseases, cancers etc. In India, ban on plastic is different in different states. Recently Mumbai, the biggest plastic waste generator banned sale, import and usage of single use plastic. Single use plastic is banned in 18 states of India. Plastic covers below 50 microns is also banned because thinner bags pose major threat o environment and not recyclable. Almost all states started charging for plastic covers. But this move is ineffective because plastic covers cost just 2 or 3 rs. and everyone is ready to buy them. Plastic ban in Sikkim is very effective when compared with all other states of India. Rwanda banned plastic since 2008 and is likely to become first plastic-free country in the world. The plastic ban in Rwanda is effective because the punishments of selling and using plastic are severe. People are fined, jailed and even forced to make public confessions if they use plastic. Approx 40 countries like India, England, China, Australia etc imposed partial bans and heavy taxes on plastic. Sweden is the best country in effectively recycling almost everything including plastic. In Ireland plastic bags are made very expensive. This step worked well and usage of plastic bags reduced drastically. Alternatives to plastic bags and covers should be encouraged by subsidies etc. Awareness programs on ill-effects of plastic should be conducted on a war-footing. Plastic waste should be effectively recycled by constructing roads and houses etc. with the plastic waste. We should target at production stage. Supply of plastic items is too high. 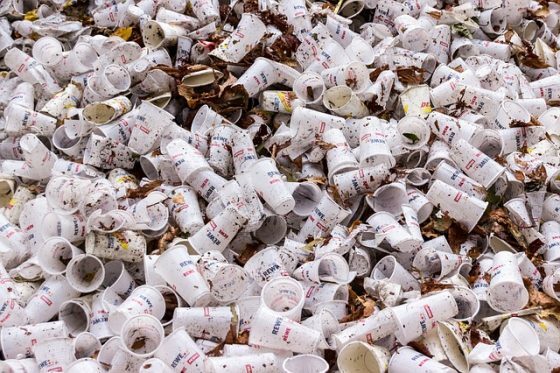 Manufacturers should be made liable for the waste. Imposing responsibility and heavy fines to manufacturers will force them to look for alternatives to pack their goods, for example some soaps are now being packed in paper materials instead of plastic. At an individual level, we should reduce plastic usage as much as possible. For example, carrying cloth bags to market, using steel water bottles can be our first step to transform our lives into plastic-free. Along with implementing bans on plastic goods, alternative materials should be encouraged. People should feel responsible for the plastic waste they are throwing. To make everyone feel responsible, extensive awareness programs are needed. Eliminating the need of plastic goods and recycling & upcycling of the plastic waste will save earth from plastic pollution. What is your opinion on this topic? Express your thoughts in the comment section below. Subscribe to our blog to read answers to trending GD topics. hi everyone. reducing plastic pollution is impossible.but we can recycle it by following steps. 1.govt must be launch a program. 2.GOVT SHOULD SUPPLY GREEN DUST BINS WITH QUATATION LIKE “USE ME FOR YOUR CHILDRENS HEALTH”.SENTIMENTS WORK IN INDIA. 3.THAT DUST BIN WILL BE USED ONLY FOR PLASTIC ONLE. 5.GOVT WILL ENROLLED TO COLLECT ALL THE PLASTIC AND RE UTILISE IT. 6.DUST BINS ARE VERY CHEAP IT TAKES AROUND 2000 CRORES TO SUPPLY DUST BINS.STATES 50 AND CENTRAL 50 PERCENT. TRUST ME FRIENDS INDIA WILL CHANGE.THANK TOU GROUPDISCUSSIONIDEAS TO GIVEA PLATFORM. In my opinion when government did not find cheap alternatives of plastic . It’s not possible to eliminate completely. Government should spend money on research and development team, which make only biodegradable plastics. True that! Without alternatives, plastic usage may not be reduced. Along with plastic using mobile phones all the time has become a necessity and fashion to use it while waking, driving, getting on and off public transport, visiting someone and much more, people are addicted to it. It is time to explore `damage it may be causing before it becomes an issue like getting rid of plastic habit. Plastic pollution is biggest challange for our country. I think plastic increases because of mainly two factors one is cheap rate and other is major people do not know their harmful effects. Many states banned plastic but it is not very successful. government should take strict action against it ,make strict rules and aware rural people about their disadvantages. well, just saying in a line is very easy that we should not use plastic bags & all. but the bitter truth is even after saying that statement we don’t change we use plastic as before.It’s not our fault completely we are just used to with. how can think of a lifestyle without plastic at a sudden ya it has ill-effects but we should find some ways to recycle the completely like ireland do. when we go to market to buy veg. we need bags, when we buy grocery we need it, when we buy cloths,gifts,books,copies,cakes etc……… so we just can’t vanish these habits at a sudden. Yes.This is the time to change people’s mindset and specifically for rural area.Awareness is needed to know the people how it is harmful for us as well as we should start a campaign for it.Only ban the plastic is not enough.An strict government authority should be there to monitoring all these stuff how successful it is implementing. Yes Swati! Successful implementation is required. Plastic pollution is a biggest threat of our country. We everybody has to take oath we will not use plastic goods and plastic bags etc. When we will go to the market to buy some vegetables or grocery item we will carry the cloth bags and we will not use plastic water bottle ,if we will not use the plastic products then manufacturers also will think for alternative product and Govt. should impose heavy penalty those are manufacturing plastic items . Plastic makes the pollution air ,water and land pollution ,it is non-biodegradable and it takes long time to make it degradable. Not only it is pollution for air and water indirectly we eat plastic, plastic mixing ocean water and ocean fish eats plastic, when we eat ocean fish indirectly we eat plastic.Many ocean animals also gets die to eat plastic. We throw plastic on the road it clog the drain as a result of waterlogging. It requires strong awareness not to use plastic, if use they have to pay the penalty. This practice should be stopped . Habit is the second nature of man ,if we practice when we will go to market we will carry our cloth bag then there will be no problem, in this way we can stop use plastic. That’s right Tinku. Using plastic became our habit and we need to change this. This is problem for every country in the world. Not as you say ” Plastic pollution is a biggest threat of our country “.